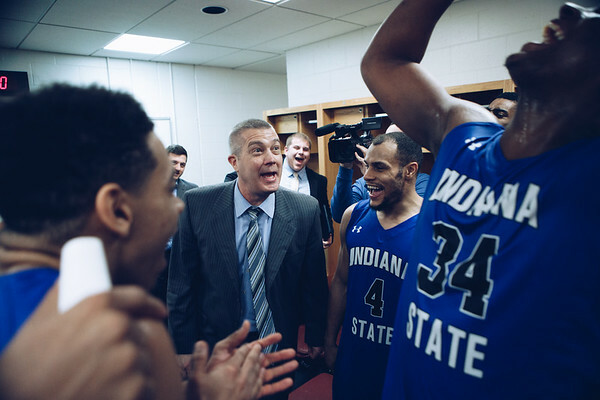 This past week Indiana State saw the improbable happen. 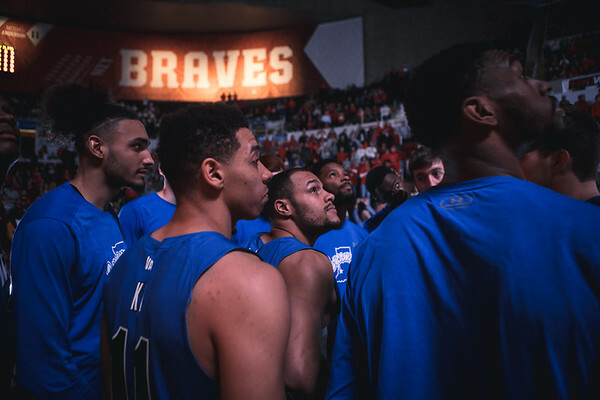 They needed a lot to go in their favor to get out of playing the play in game at Arch Madness. When the final day of the season came around they needed two things to happen. One was that Missouri State had to lose to Northern Iowa. The second was that they had to beat Bradley at Bradley. 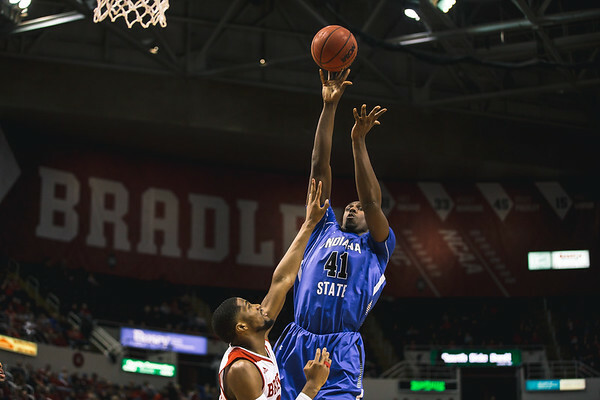 Before Indiana State even played Northern Iowa did their job and beat Missouri State. 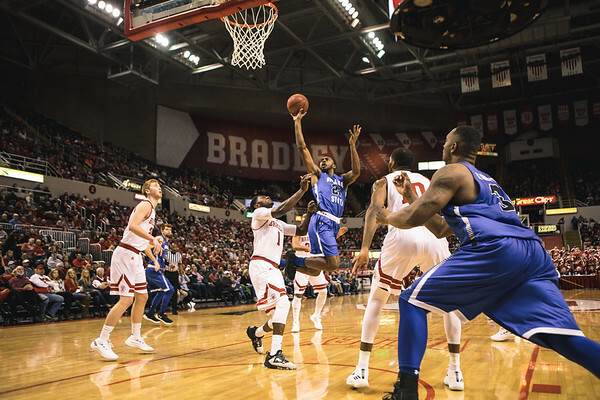 Now Indiana State had to do what only one other team had done so far this season. Win a game inside of Carver Arena. When the final horn sounded they had accomplished their mission, and they miss the play in game on Thursday in St. Louis. March is not even here yet, but you could not tell by the way that game was played yesterday. It was as intense as any March game will be. This season started with a great road win at Indiana. 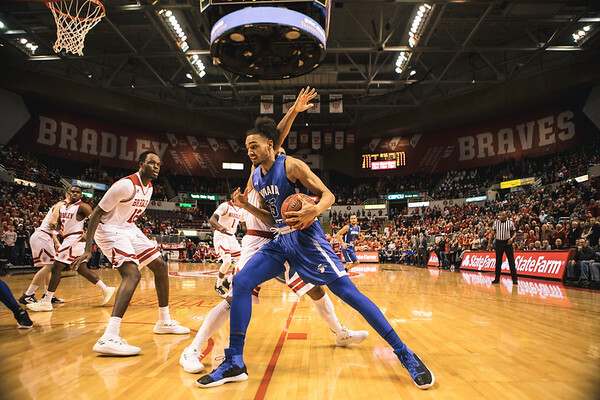 That game was easier to take though as Indiana State had control the entire time, and the final score was the only thing in doubt at the end. This game was a back and forth affair that was not decided until the final horn. Both of these wins were in a tough environment, and spoke to the toughness of this team. They need to channel that same energy this weekend coming up in order to make a run. When I started getting serious about sports photography I was always told to keep the background as clean as possible. Sometimes though I like to break that rule. At Bradley I sat in a spot to do just that. I wanted to put the Bradley signage in as many photos as I could to help tell the story of the day. Once I switched to the other end of the arena I focused more on the game and not getting a shot in a good background. After a big win like yesterday there are always good jubilation photos. I love to make photos of ‘jube’ as I call it. It is great to see these young men and women who have worked so hard enjoying the fruits of that work. I hope that these are not the last jube photos I get to make of this team this week. Some nice celebration photos in St. Louis are always a great way to cap off the season. Today I will be traveling to Terre Haute again to cover senior day for the Indiana State women. Unlike the men I do not know what my postseason plans are for them. This very well could be the last time that I see them play this season. They have really come on strong at the end of the season, and become a very fun team to watch. Next weekend I will be in St. Louis following the men’s team on what I hope is a long run. They have already advanced to Friday without even playing a game there. Arch Madness is a fun tournament to shoot so I hope that I get a couple of days there.